*To allow all pupils the opportunity to have regular and equal access to ICT in order to develop their skills and understanding, meeting National Curriculum requirements. *To be able to apply their knowledge and skills to other areas of the curriculum, in order to enhance the quality of their own leanring. *To provide access for pupils to a wide variety of ICT equipment enabling them to become more confident, effective and independent learners. *To explore their attitudes towards ICT, its value for themselves, others and society today. In our computer suite, there is a bank of 22 up-to-date computers and an Interactive whiteboard. All children from foundation stage to key stage 2 have a one hour lesson per week. Every classroom has at least two computers. There are also netbook computers and a class set of digital cameras avaliable for classes to support pupil's learning. Other resources include, Roamers, Bee-Bots, Pixies, Lego NXT, Voice recorders, video cameras and remote control toys. 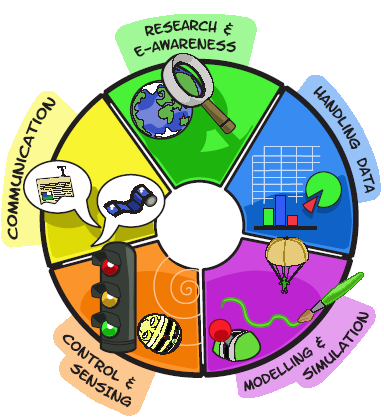 In every year group children will learn new ICT skills in each of the five main ICT areas, (Communication, Research and E-awareness, Handling Data, 'Modelling and Simulation' and 'Control and Sensing') this will be through the main ICT lesson and via other topic lessons. It is important that the children do not just learn the skills but understand how to apply them as well. All Internet use in school is monitored and checked on a regular basis. The school has filtering systems and firewalls in place which are updated frequently. The use of safe search engines are promoted with the children when they are researching on the web. ALL children are made aware of the rules for using the computers and have signed an agreement. Rules for using the computer are displayed next to every machine. All staff also sign an acceptable use statement every year. E-safety is taught to the children in lessons and they are encouraged to follow the SMART rules. An E-safety awareness evening is held every year for parents to attend.